My absolute favorite time of year in NYC is at Christmas time. The magic of this time of year is almost indescribable. Some of my favorite Christmas movies are in NYC like, Miracle on 34th Street, ELF and Home Alone 2 Lost in New York. Growing up watching these moves seeing the beauty of NYC at Christmas, it makes it extra exciting when you finally get to experience it in person. The energy of the city, the lights and decorations, not to mention the amazing Christmas trees to see! I visited NYC at Christmas for the first time probably 10 years ago, and let me tell you, it never gets old! Now that we live in the Northeast we make sure to do the NYC Christmas sights every year. I decided to make a list of my favorite things to do in NYC at Christmas. So if you’re planning a trip, I hope this list helps you in making your plans. (I linked each spot to Google Maps, so if you click it you can see exactly where it’s located in Manhattan). *These are all photos I’ve take in NYC during the Holiday season. Some are featured on my Instagram, be sure to follow me there too! 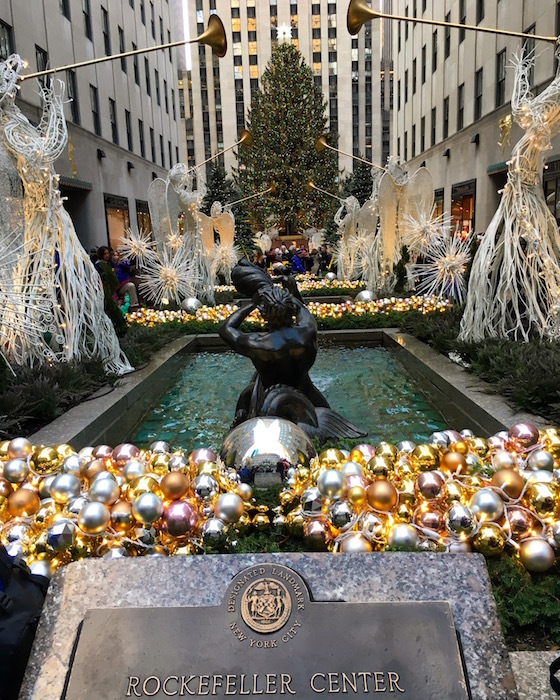 Rockefeller Center Tree – the most famous and probably most obvious thing to do is see this tree. This is a very touristy spot, so be prepared for crowds. But it’s worth it! The magic of this iconic tree, the decorations and the ice skating rink. It’s stunning! 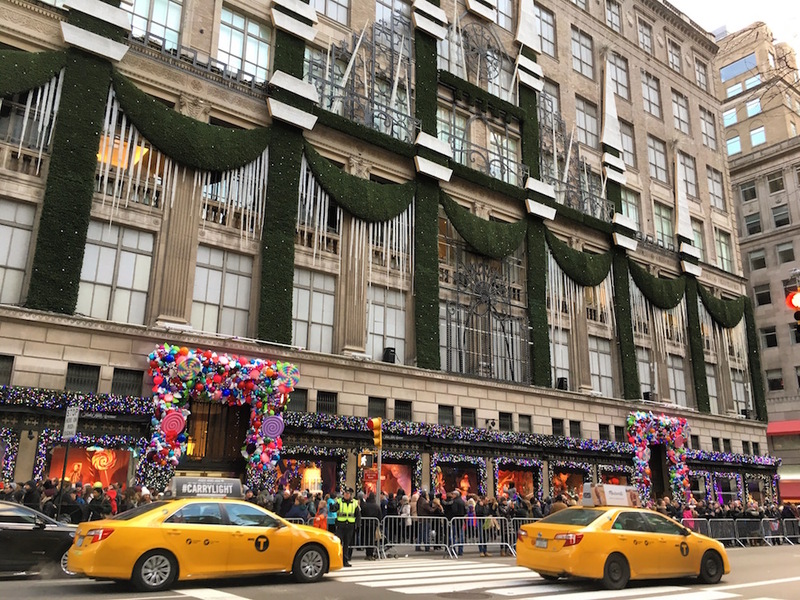 Saks Fifth Avenue – This iconic department store is right across the street from Rockefeller Center. They do a beautiful Holiday display including a show on the side of the building with lights and music. Each window front is decorated as well. 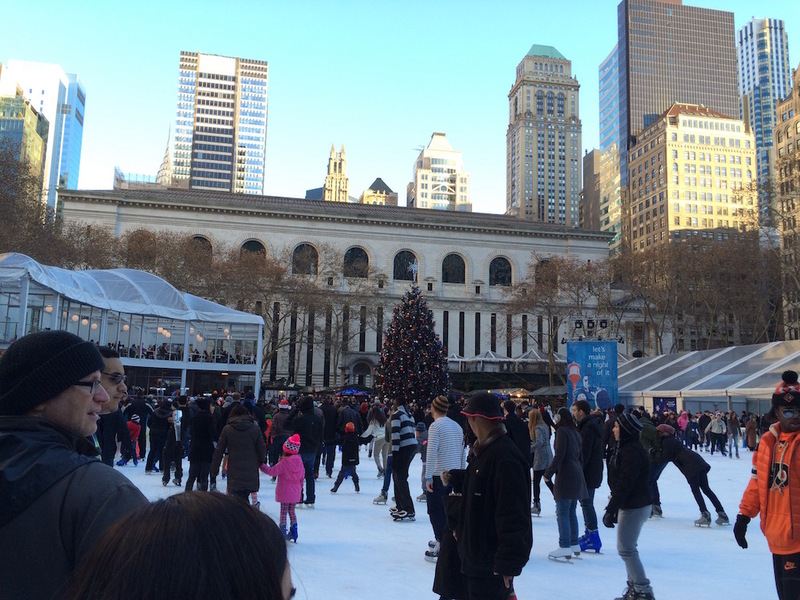 Ice skating – Rockefeller Center, Bryant Park, and Central Park are all great options. This photo is at the Bryant Park skating rink. They have a huge Christmas tree, and that’s the New York Public Library behind it. The Bryant Park rink is free, you just have to pay for your skate rental. 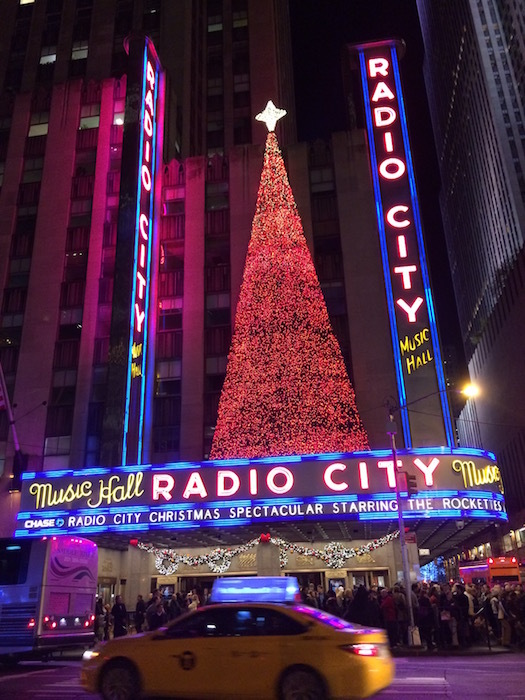 Radio City Music Hall – Radio City is always all dressed up for Christmas. They have the Christmas Spectacular show starring the Rockettes all month long. 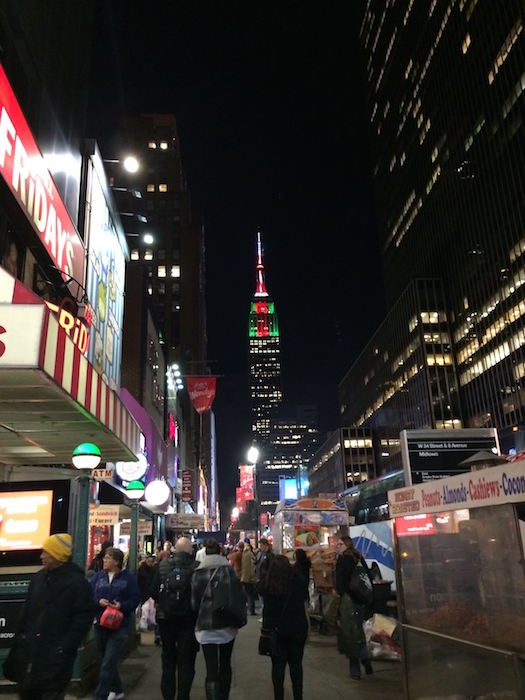 It’s only about a block away from the Rockefeller Center tree, so you can see a lot of things in a few block radius. Empire State Building – The iconic Empire State Building is always lit up all year long. But at Christmas they always do beautiful colors of Red and Green. 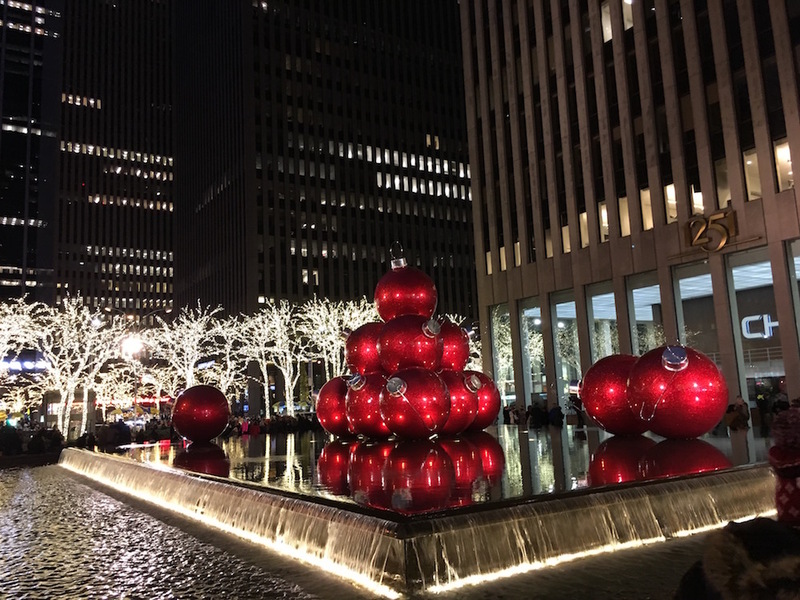 Christmas balls – These are located across from Radio City on 6th Ave between 49th and 50th. They are there every year. It’s a fun spot to take a photo. 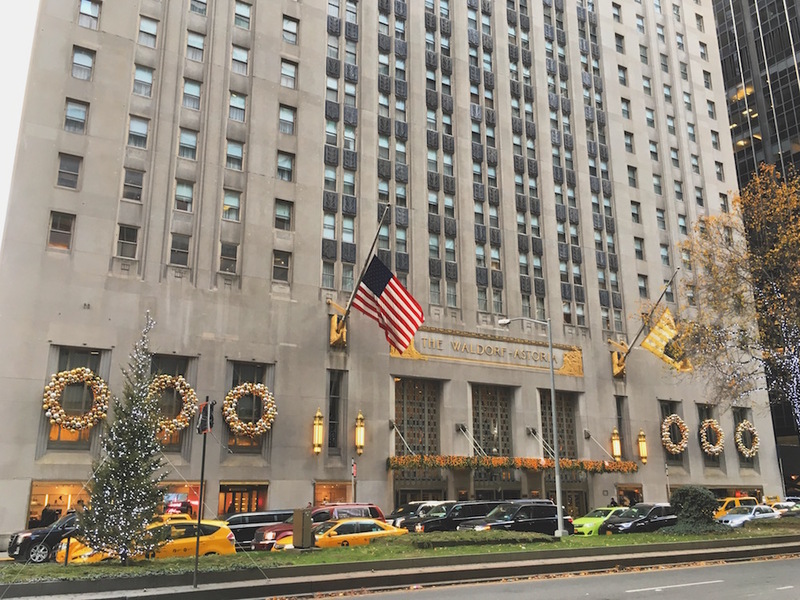 The Waldorf Astoria – This famous hotel featured in movies like Serendipity looks really pretty at Christmas with the huge wreaths and garlands. 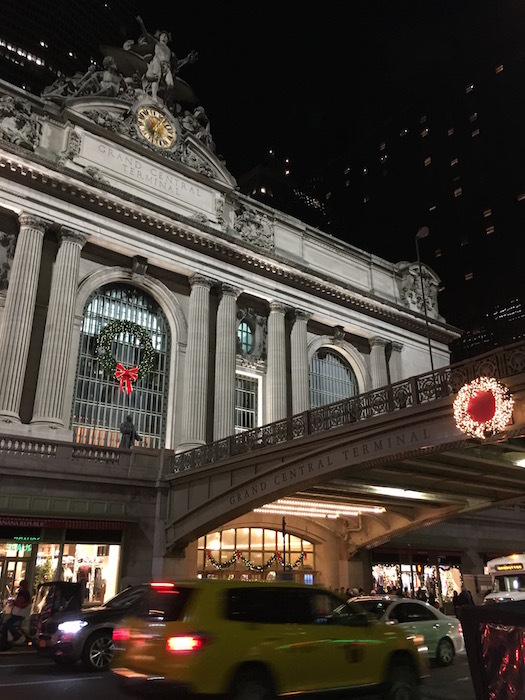 Grand Central Terminal – The outside of Grand Central looks so beautiful with the wreaths and lights, but don’t leave without going inside. The inside is always decorated too and they always have different Holiday markets you can enjoy. Holiday Markets– Bryant Park, Union Square and Grand Central are just a few of the many Holiday Markets throughout the city. 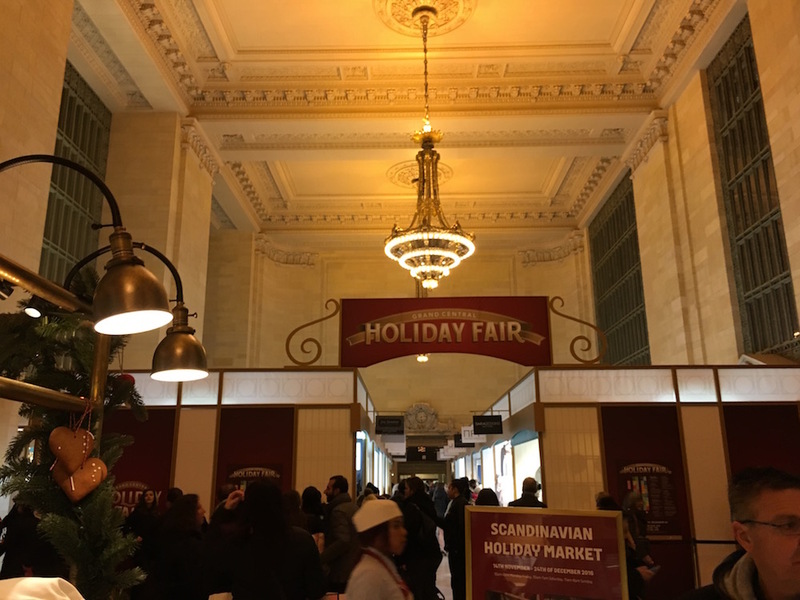 This photo is at a Holiday Market inside of Grand Central. 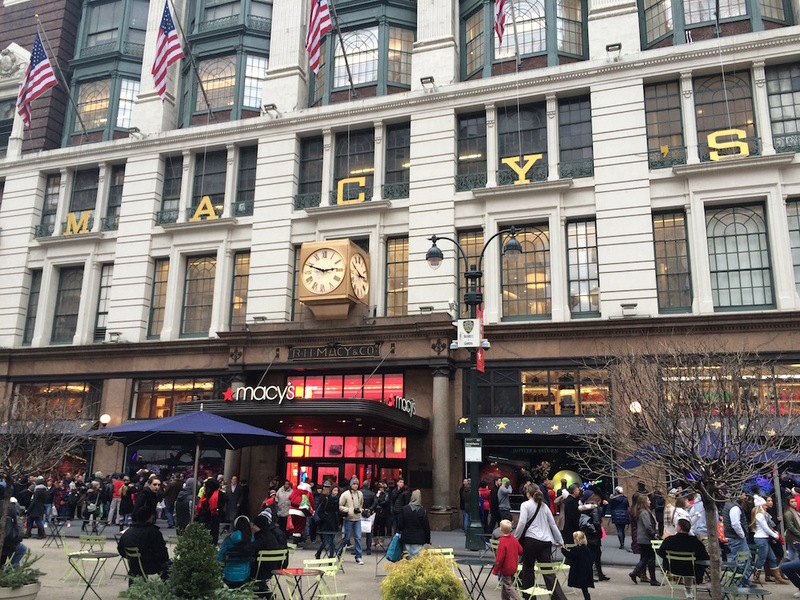 Macy’s – The World Famous Department Store has beautiful decorations at Christmas. The window displays are fun, but don’t just stop there. Head inside to see the decorations inside the store too. Also, in the basement they have a section of “Macy’s” souvenirs, things like Christmas decorations and shirts. 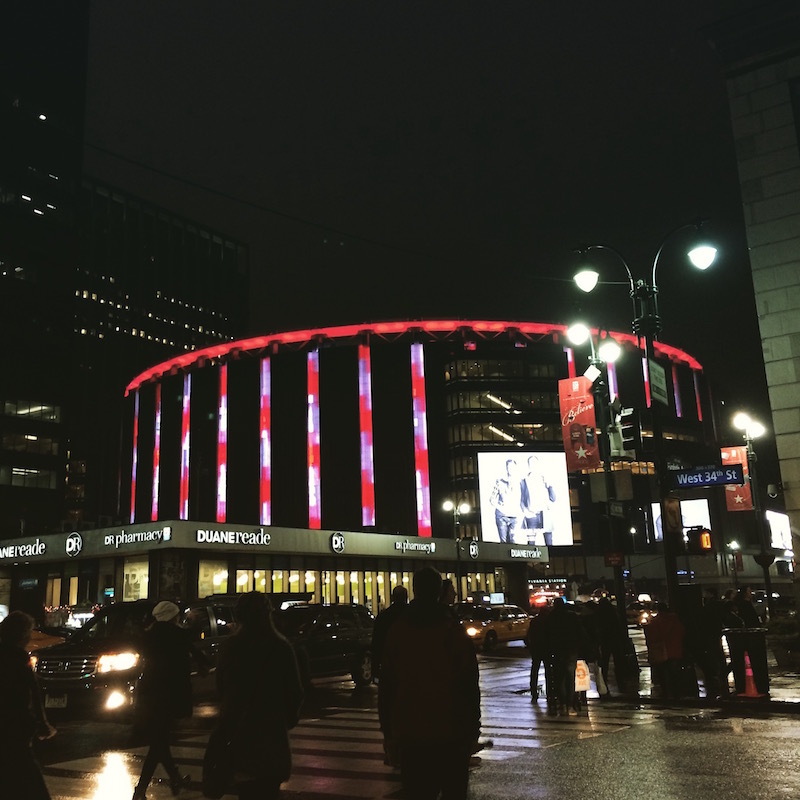 Madison Square Garden – This photo was taken on Christmas Eve 2 years ago. The lights on Madison Square Garden looked like candy canes. If you’re walking down 34th Street be sure to take a look at Madison Square Garden and see how it’s lit up. Christmas shows – There are always several Christmas shows to see throughout the city. 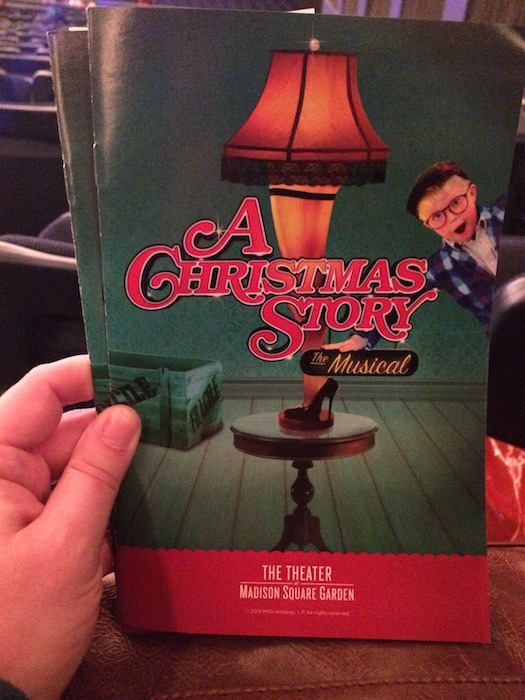 The Theater at Madison Square Garden does Christmas shows every year, we’ve been to see “A Christmas Story” and “The Grinch that stole Christmas” at this theater. Christmas Decorations – there are plenty of spots throughout the city that are decorated that I haven’t mentioned. Be sure to pay attention as you walk around and enjoy the beauty! 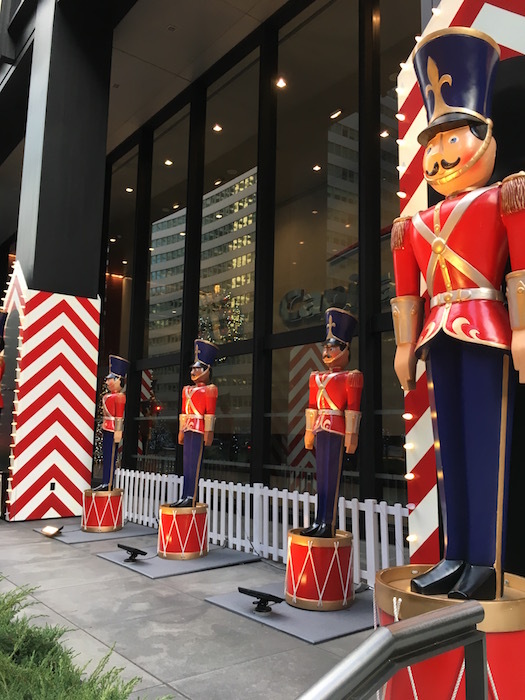 These giant nutcrackers were in front of a bank in Manhattan. 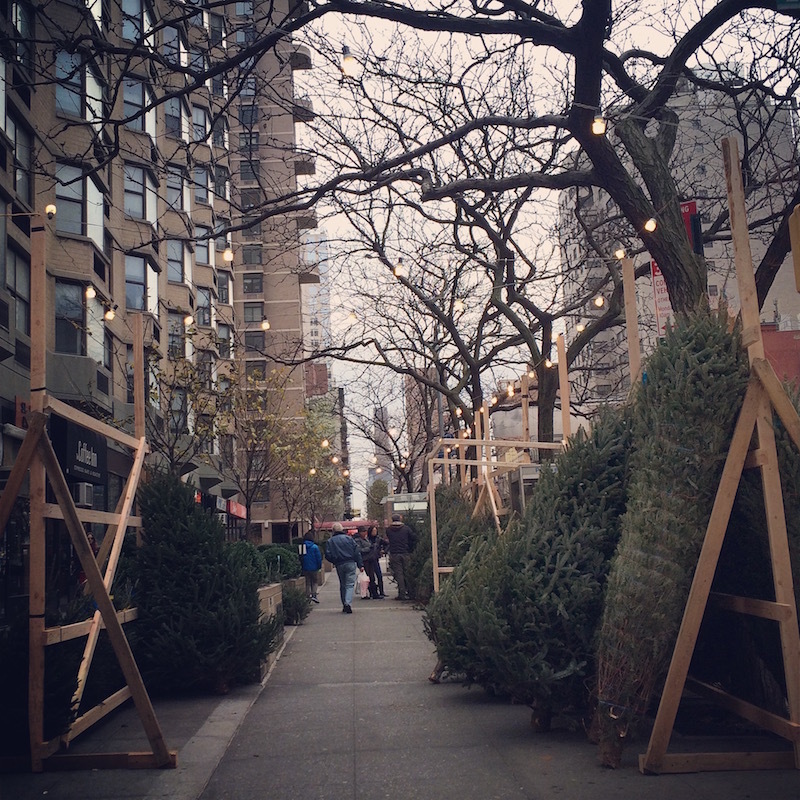 Christmas trees for sale in Manhattan – Christmas trees are sold on the sidewalk’s in Manhattan, its always fun walking through the displays and smelling the fresh trees. 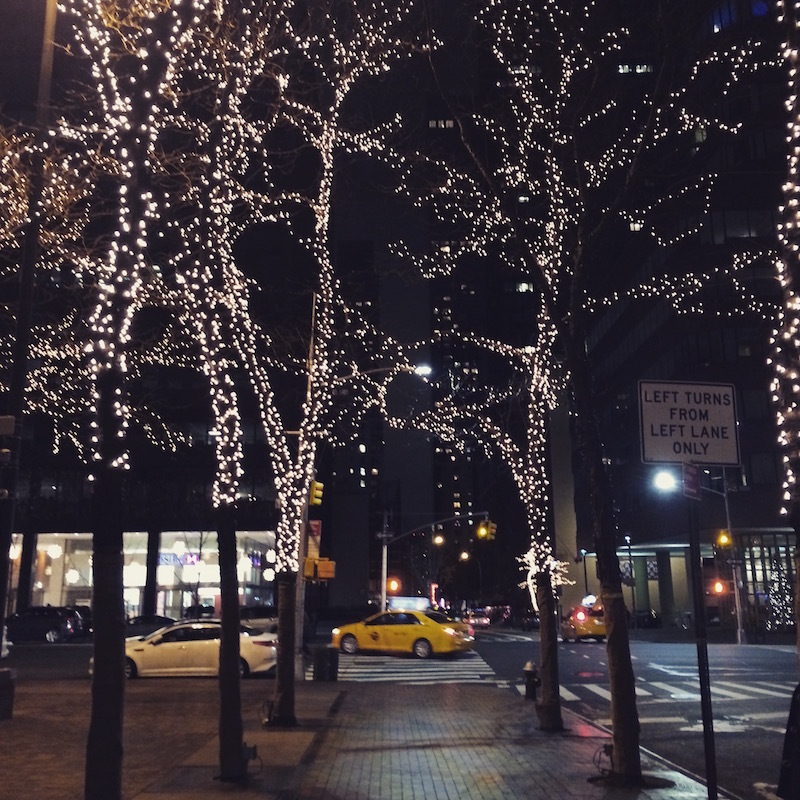 Christmas lights all over the City – The magic of Christmas in NYC really is everywhere! I hope you enjoyed this post! If you’ve never been to NYC or maybe you’ve been 100 times, I definitely recommend you come at Christmas time! It’s a must!! The decorations are always up the entire month of December, so you have a whole month to get there and enjoy the sights! Merry Christmas! 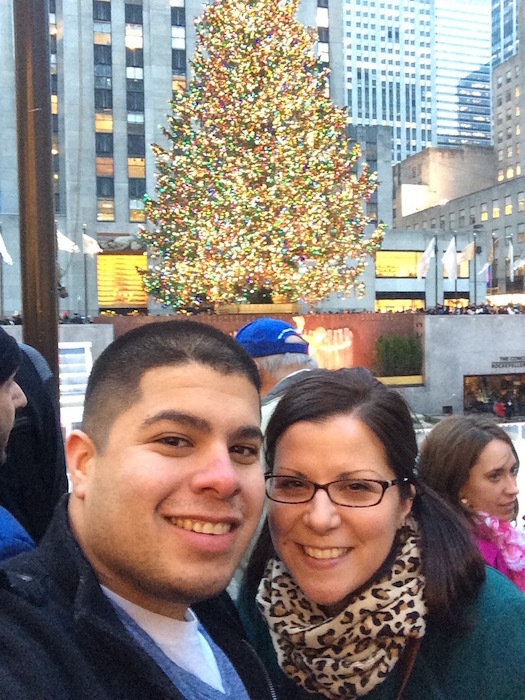 Here’s a photo of us in front of the Rockefeller Center Tree. Gotta get that selfie in! What are you’re favorite NYC sights at christmas time? Did I miss one? Feel free to comment below!